Whereas in Schrödinger’s wave mechanics, particles move by waves that guide them, in Werner Heisenberg’s matrix mechanics, particles move by quantum jump, and this movement can only be measured in probabilities. Schrödinger wrote that he was “repelled” by Heisenberg’s matrix mechanics because of its difficult, unfamiliar mathematics and lack of visualizability. He could not accept the paradoxical nature of the quantum jump and refutation of causality in matrix mechanics. Albert Einstein, like Schrödinger, was also unable to conceptually break free of Newtonian space and time. Heisenberg, on the other hand, working from ideas developed by his mentor Niels Bohr and others, allowed for the imagination to play a role in his physics and accepted the paradoxical, counter logicality and lack of causality in matrix mechanics. He subverted the axioms underlying the prevailing physics of his time so much that physics itself was radically reconceived. One fascinating aspect of Heisenberg’s quantum mechanics is that he arrived at his principle of indeterminacy by developing a visual matrix of numbers and symbols depicted in rectangular arrays arranged in rows and columns that are “read” right to left, left to right, up and down, down and up, and more. Thus Heisenberg’s mathematics have a visual component but are not easily visualizable as concepts and are therefore theoretically abstract. While other mathematics were written in matrices, none were doing so while rejecting causality, certainty, and linearity in physical systems. I wonder about the relationship between the visual, formal composition of the mathematics in quantum mechanics and its innovative content. Was matrix mechanics the visual poetry of theoretical physics? 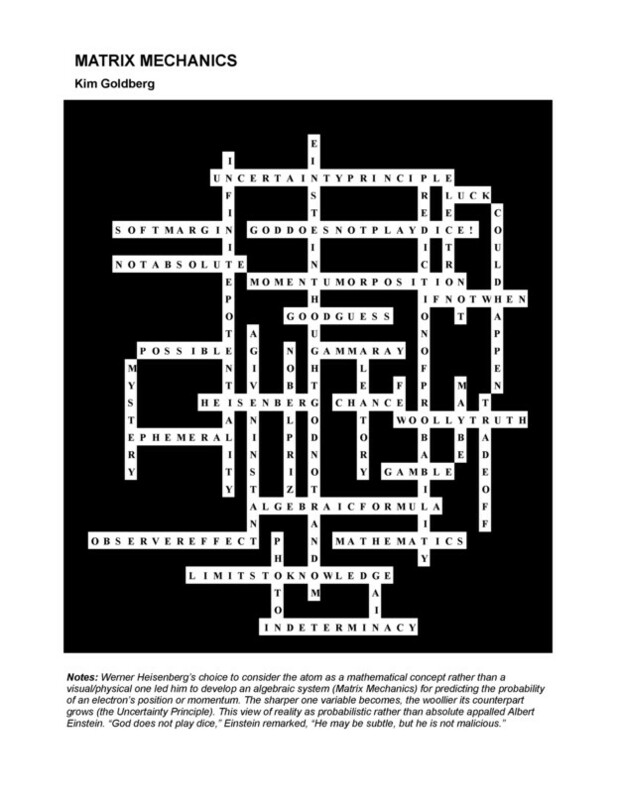 Are current practitioners of visual poetry such as Kim Goldberg and Andrew Topel continuing to extend the definitions of poetry and visual art by using visual information at the scale of procedure or content in much the same way that Heisenberg extended theoretical physics by at least somewhat invoking the spacetime of the page to refute causality, certainty, and linearity? 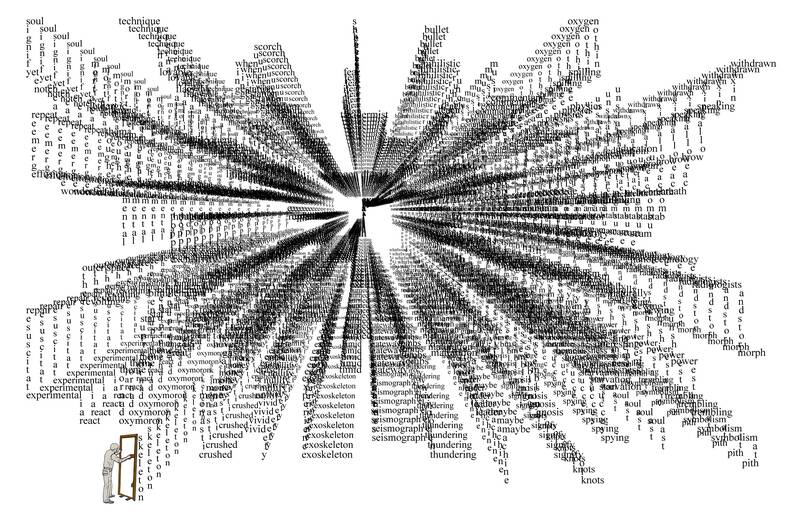 Andrew Topel’s visual poem, “Doorway,” courtesy of Andrew Topel. Schrödinger’s wave mechanics, initially championed by the status quo in physics, was at odds with Heisenberg’s more obscure and complex matrix mechanics, so when he proposed wave mechanics, which offered visualizations and familiar mathematics, most physicists such as Einstein welcomed his interpretation over Heisenberg’s. Schrödinger claimed that his wave mechanics and Heisenberg’s matrix mechanics produced equivalent results but that his theory was superior to Heisenberg’s because, among other things, it rejected that particles move by quantum jump. After Schrödinger made this claim, Heisenberg, in a letter to Wolfgang Pauli that later became published as an article publically presenting the uncertainty principle, seemingly verified that particles move by quantum jump with his mathematics. At the time of his discovery in 1927, Heisenberg was a lecturer in Bohr’s Institute for Theoretical Physics at the University of Copenhagen in Denmark. In 1929, he went to the University of Chicago and gave a series of lectures, published in a book the next year, explaining quantum mechanics. The theory became the prevailing model of physics and remains so today. Clearly there are parallels between uncertainty and the way particles move by quantum jump in subatomic systems with aesthetic ambiguity and a lack of causality in some forms of poetry and other artistic contexts. In my four-part speculative essay on quantum poetics in Jerome Rothenberg’s Poems and Poetics, essays that respond to and, perhaps, extend the work of other thinkers, I argue that aesthetic ambiguity and lack of causality in poetry do not just happen to coincide with how uncertainty and quantum jumps occur in subatomic systems, but that uncertainty operates as a fundamental force within artistic contexts and physical reality in much the same way that electromagnetism operates as a fundamental force in the known universe. Robert Anton Wilson discussing quantum mechanics in Maybe Logic (Disinformation, 2006).